T has a lot of clothes; better clothes than me; he doesn’t actually need any of this but if he suddenly growth spurts, this is my planned update. Much of his wardrobe he has chosen himself. He loves bright colours but has recently requested black cord trousers and less print on his t shirt or has request me to print a custom logo on a bright tee. Here is his round up of what he wants to add to his existing wardrobe. 2. Mini Boden joggers. These were picked out due to the rainbow stripes and the thicker quality of jersey that is so soft. T loves a soft feel of t-shirts and joggers! 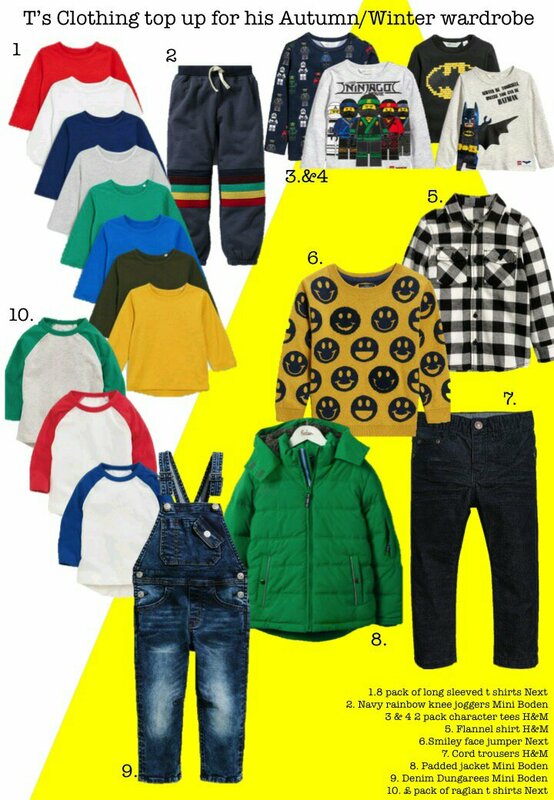 From Mini Boden but shopped thru the Next Offer. 3&4. As T gets older more and more character t shirts slip in. This summer when his sister has been at nursery on a Friday, T and his Daddy have been going off out, watching films and eating ice creams. The trailers have been mainly for Ninjago; The new Lego film out in the Autumn. T has his heart set on watching it but it’s not rated yet! Not sure if it’s going to be suitable for a 5 yr old; thoughts on this would be appreciated. T picked out these 2 packs on a store visit to H&M last month so I’ve bought the Ninjago pack as part of his birthday present. The Batman pack is pretty awesome too. 6. Smiley face jumper. Such a bright glorious layer. I loved it as soon as I saw it. Bright, bold and brilliant with denim or cords. From Next. T says he likes the smiley face but wishes it was orange. 7. These corduroy trousers are from H&M. We have them in Royal blue, red, mustard and pale grey. T reminded me we did not have then in black. Black! You are not a teenager. Am I growing a Goth? 8. Toasty, padded Mini Boden jacket. This is so full and plump. Glorious colour green. An excellent 3rd layer. This will easily take T thru till Spring and be squirreled away for G. Mini Boden available thru the Next Offer. 9. Dunagrees. H&M do an excellent range of denim. They wash and wear really well. I hated dungarees on kids but I put a pair on T aged 3 and I then U turned and tend to buy a pair each year. From H&M. All images are taken from the Brand websites. Hyperlinks have been added to help the shopper.